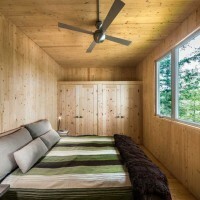 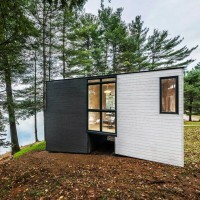 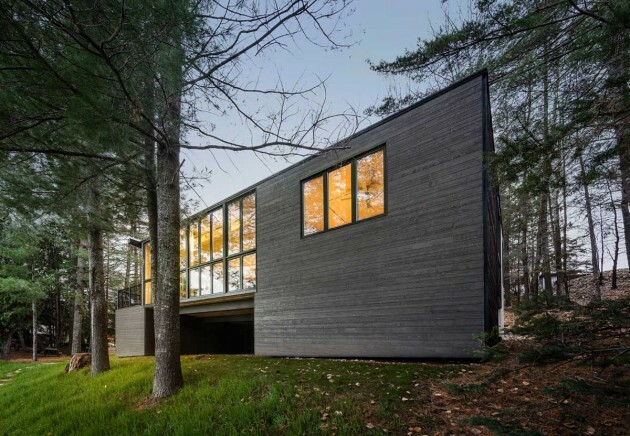 Kariouk Associates have designed the Mulvagh-Crosby Cottage in Ladysmith, Quebec. 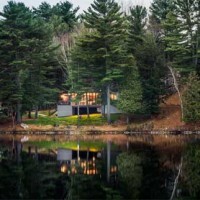 The site for this project is a remote, private lake beside which for more than seventy years existed a family’s timber-frame cottage. 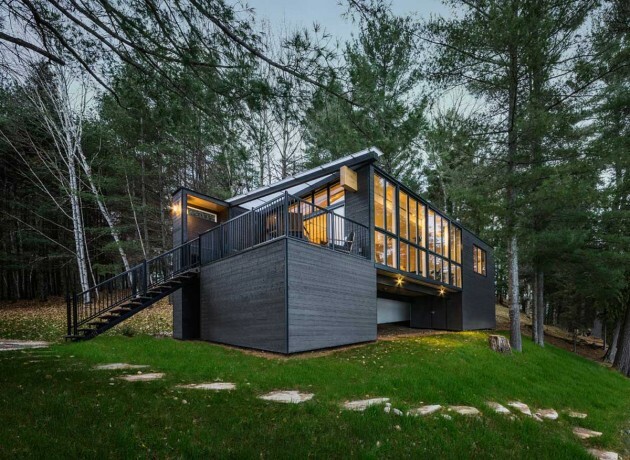 When the land passed from mother to son, the decision was made to reinvigorate the home; ultimately, because the home had already reached such an advanced state of decay, it was decided to have it removed and to build a new cottage. 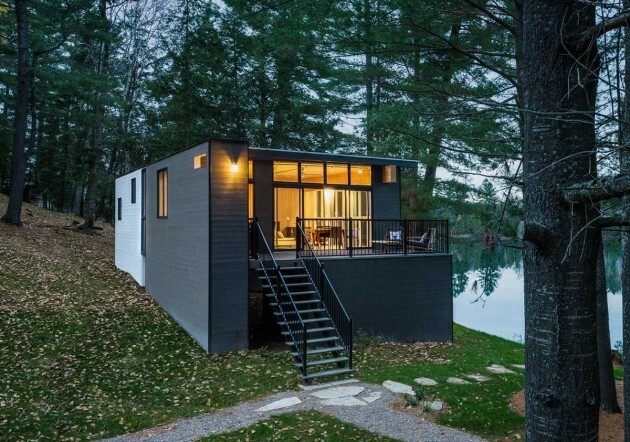 For sentimental reasons, the new home was to be the exact dimensions of the former and it was to sit in the exact same location. 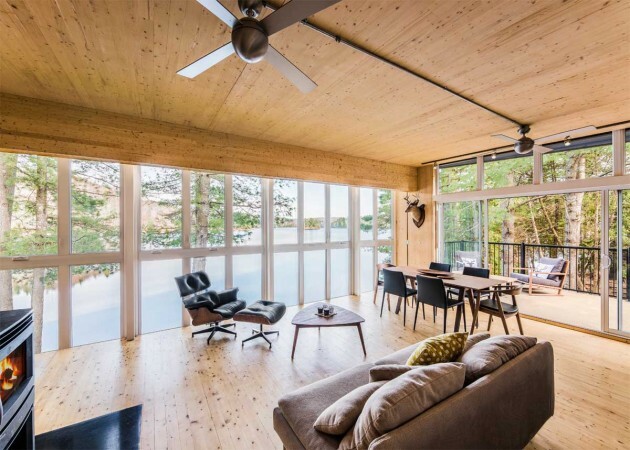 Aside from those requirements, though, a far more open spatial arrangement was desired, but the character of the original wood home had to be reintroduced, albeit transformed with a modern architectural language. 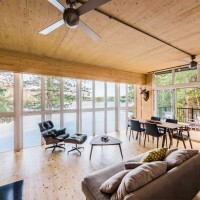 However, construction intentions were complicated by the fact that the remote location meant that skilled labor for stick-framing would not be available, and the cost of such labor “commuting” from the city would be extreme. 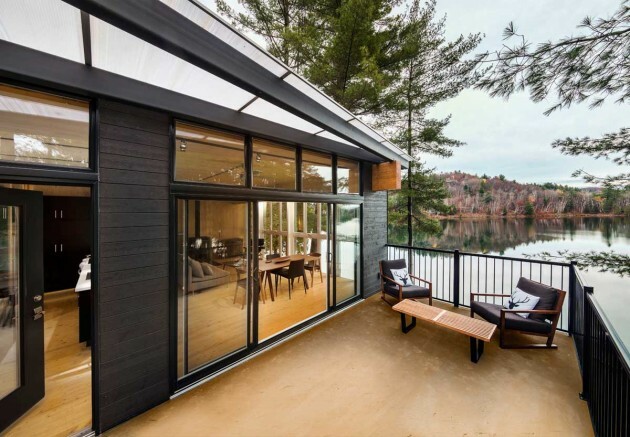 In order to minimize the cost of skilled workers on the construction site while simultaneously ensuring the highest quality of construction, the decision was made early on to pursue the use of prefabricated parts. 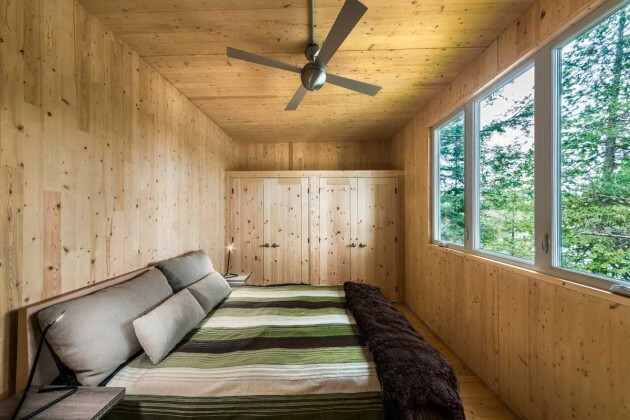 Specifically, the material selected was Cross Laminated Timber (CLT), cross-wise glued-laminated black spruce boards that can be fabricated in panels as large as sixty feet by ten feet. 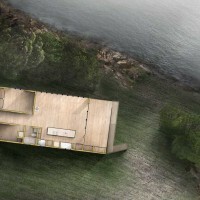 A detailed computer model was generated for every surface that would comprise the cottage whereby every opening and cut needed for assembly, apertures, and services was indicated. 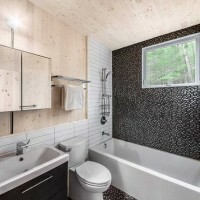 This information was then sent to a computer controlled milling machine that produced the finished panels. 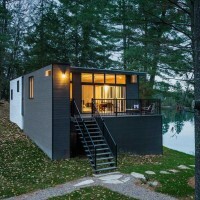 These were brought to the site, where a helical-post foundation system was installed the week before, and hoisted into place; the entire shell of the cottage was assembled in less than two days. 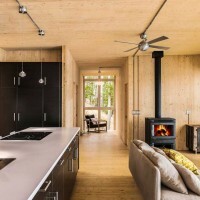 While the technology to mill the CLT panels is “modern,” the cottage is in fact identical in construction and materiality to a traditional log home where fully milled elements are simply joined together. 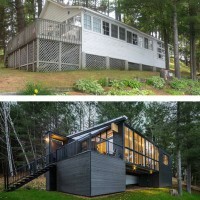 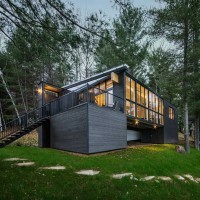 Aside from the helical piles and beams below, every surface of the cottage enclosure is made of five-ply CLT sections along with a primary glulam beam; the enclosed sections beneath the cottage that serve as sheds are stick framed, and the rain screen is comprised of a light and dark coloured pine siding. 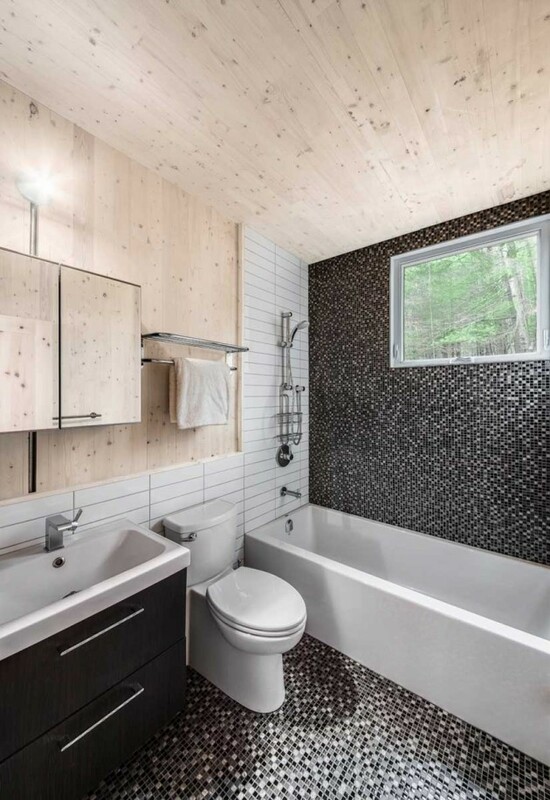 In order to maintain the full richness of the wood’s surface on the interior, the walls are alternately left unfinished, or in the case of the bathroom, they are whitewashed; the floor is protected with a clear sealer. 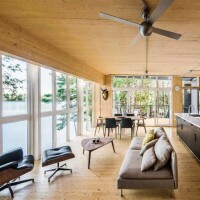 While the wood creates a rich and warm atmosphere, historic, wood construction “ornamentation” was rejected given the high-tech reality of the exposed CLT. 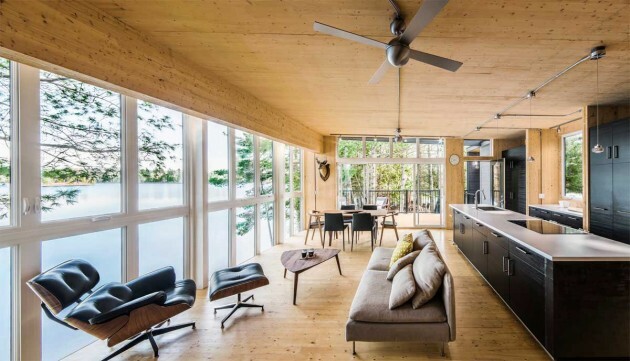 Moreover, an almost industrial aesthetic was achieved by exposing the electrical services, which are themselves made into ornament via pre-milled conduit recesses.